Seeds contain the genetic material of the new plant and reservations for its first phase of development. They are rich in monounsaturated and polyunsaturated fats and a excellent vegetable source of omega 3 and 6. Provide calcium, magnesium, phosphorus, iron, potassium, zinc, vitamins B and E, protein and fiber. The seeds are good snacks and highly recommended as a condiment in salads. They are low in saturated fat and very nutritious. Because of its high caloric value have been erroneously removed from the diet. 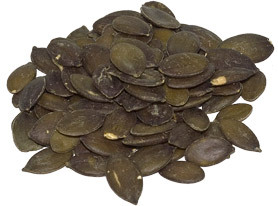 A spoon of sunflower seeds -10 g- contains 60 Kcal and provides multiple benefits. Consult your dietitian. 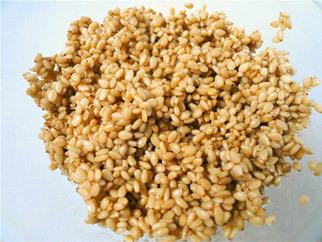 Golden flax seeds are rich in Omega 3, fatty acids, fiber and proteins. Can be taken as any other food, but their properties have various health benefits. 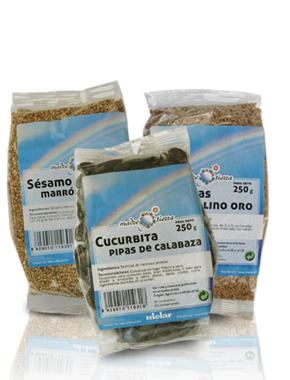 They contain omega 3 and omega 6 obtained from a vegetable source with a high content of DHA. Therefore it is highly recommended in vegetarian diets. A daily intake will help keep out the bad or LDL cholesterol and triglycerides and increased HDL cholesterol. They also act as lipid antioxidants. They are rich in mucilage. If you grind them and mix them with water they act as a mild osmotic laxative, take one tablespoon of the grinded seed with a glass of water before bedtime. Recommendations: Take up to 2 tablespoons of grinded seeds daily. Source: EU and non EU Agriculture. 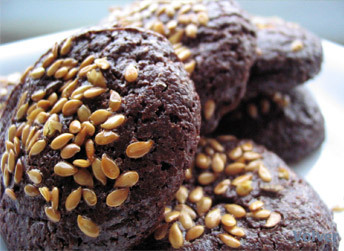 Mix pumpkin seeds, sunflower, sesame, brown flax, golden flax and poppy from organic farming. 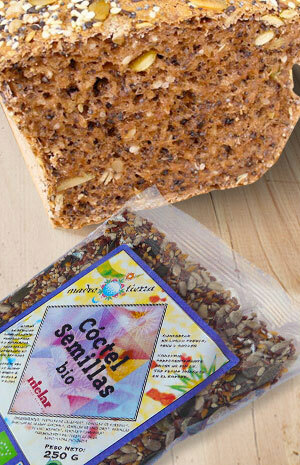 Specifically designed to add on salads and casseroles and the homemade bread with seeds. 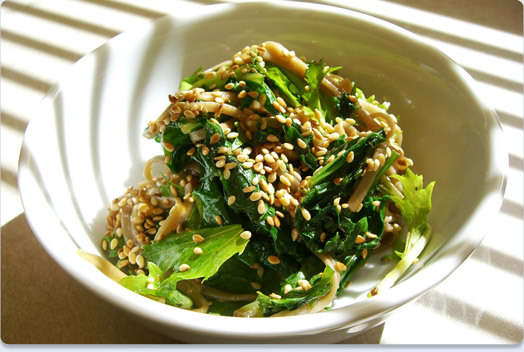 Sesame stands out for its richness in calcium, that is why it is indicated in deficiency calcium conditions such as osteoporosis, bone weakness, hair loss and tooth decay. It is also beneficial in treating circulatory problems. Its richness in omega 3 and omega 6 and its ability to lower blood cholesterol has made it very popular in treatments against atherosclerosis, prevention of heart conditions and arterial thrombosis. Hindu yogis recommend a daily intake of 25 g to regenerate the body tissues. Recommendations: Consume preferably grinded and sprinkled over all kinds of foods such as soups, vegetables and cereals. For centuries pumpkin seeds have been known for their medicinal properties. They are a highly nutritious food. They are rich in unsaturated fatty acids, omega 3 and omega 6. They also provide vitamin A, E and most minerals, especially zinc. Notable for their contribution of fatty acids, vitamin E, carotenoids and cucurbitina amino acid (inhibitor of alpha 5-reductase) that confers anti-inflammatory properties and helps prevent prostatic hyperplasia. Its high content in cucurbitacin gives them vermifuge properties so it is used to treat children with intestinal worms. Sunflower seeds are an important source of antioxidants, especially vitamin E.
Rich in minerals, vitamins and omega 3 and omega 6. 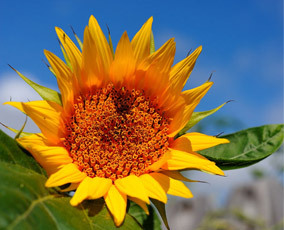 And last but not least, sunflower seeds are rich in nutrients that are associated with the prevention of cardiovascular diseases, as well as folic acid and magnesium. Nutritional information per 100 g: Energy 581 Kcal / 2429 Kj, Protein 27g, Carbohydrates 8g, Fat 49g.